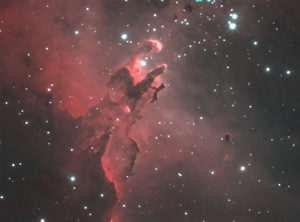 The Eagle Nebula is one of the iconic objects of the night sky made famous by the Hubble Space Telescope. But, how many realize that it is not a small object? The field of view in the image shown here is about half a Moon-diameter in wide and a little less than that in height. The nebula is an emission nebula. It shines brightly in so-called Hydrogen-alpha light, which is a very deep red color near the edge of the range of visible light detectable by human vision. But, it is fairly easy to take nice photographs of this object. The image shown here was taken by me with my 10 inch reflecting telescope. Total exposure time was two hours.